Last updated by Shari Harley at September 10, 2018 . Most people wait way too long to give feedback. We wait for the right time, aka when we’re comfortable. That day will not come. Instead of waiting to give feedback until you’re about to explode in frustration, or until a formal review, give feedback every time you meet with someone. Managers, make it a practice to meet with each of your employees at least once a month. Twice a month or weekly would be better. But if you’re not doing one-on-one meetings now, start meeting monthly. If you’re meeting monthly, start meeting twice a month. Employees need face time with their boss. Team meetings and casual conversations do not replace individual meetings. 1. What she’s working on that is going well. 2. What she’s working on that is not going well. 3. What she needs help with. 4. Then the manager gives feedback on what went well since the last meeting and what could be improved. 5. And the employee gives the manager feedback on what has gone well since the last meeting and what could be improved. Feedback goes both directions. Managers, if you want your employees to be open to your feedback, ask for feedback from your employees on what they need from you. Give feedback on both the work and your working relationship. A poor working relationship often motivates employees to leave a job, but it’s the last thing that gets discussed. Feedback discussions should be short. You can say anything in two minutes or fewer. No one wants to be told she isn’t cutting it for 20 minutes. Say what you need to say and end the conversation or move on to another topic. If you work for someone who is not forthcoming with feedback, ask for feedback. 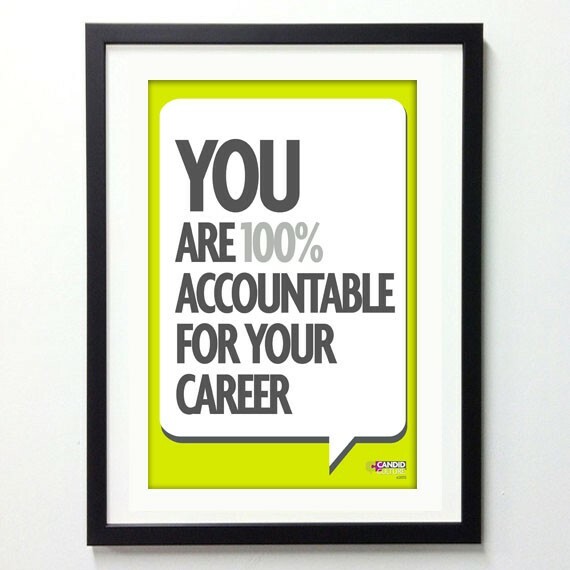 You’re 100% accountable for your career. Don’t wait for your manager, customers or peers to give you feedback. Ask for feedback on a regular basis. If meetings get cancelled, reschedule them. If your manager says these meetings aren’t necessary or she doesn’t have time, tell her, “Your regular input is helpful to me. What’s the best way to ensure we catch each other for a few minutes each month?” Meaning, push the issue. If your manager still doesn’t make time for the meetings or doesn’t provide clear and specific feedback, even when you ask for examples, ask your internal and external customers and coworkers for feedback. The people you work closely with see you work and will likely give feedback, if asked. No news is not necessarily good news. Waiting six months or a year to receive performance feedback is like going on a road trip from St. Louis to Los Angeles but not consulting a map until you arrive in New York, frustrated and far from your desired destination. Managers: Meet with employees monthly, semi-monthly or weekly, and give feedback every time you meet. Employees: Ask your managers, customers, and coworkers for regular feedback, and take control of your career. You will be passed over for jobs, projects, and second dates and never know why. Being passed over isn’t necessarily a bad thing, not knowing why is problematic. If you don’t know why you’re being passed over, how can you be prepared for next time? Organizations are political. 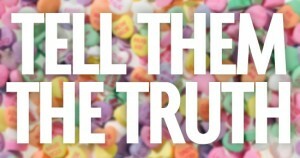 People talk. You’ve undoubtedly already experienced this. If you want to manage your professional reputation, one thing you must know is who talks about you and what they say. How decisions get made in organizations isn’t always obvious. There are the obvious channels of decision making, like your boss and your boss’s boss. But there are also the people who talk to your boss and boss’s boss and have an opinion about you, who you may not be aware of. 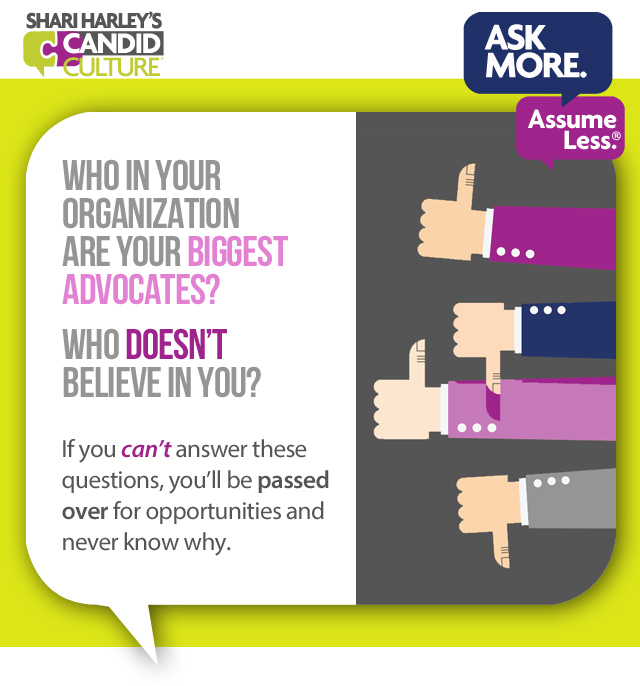 Everyone in an organization has people they trust, who they listen to and confide in. Who those trusted people are isn’t always obvious. When you’re being considered for a new position or project, the decision makers will invariably ask others for their opinion. Knowing who does and doesn’t support you in a future role is essential to managing your professional reputation and career. I don’t want you to be nervous, paranoid, or suspicious at work. I do want you to be savvy, smart, and aware. It’s not difficult to find out who can impact your professional reputation at work, you just need to ask the people who know. Start with your boss. S/he likely knows and will tell you, if you ask. Who in the organization should I have a good relationship with? Who/what departments should I be working closely with? Who impacts my professional reputation and the opportunities I have? What skills do I have that the organization values most? What contributions have I made that the organization values most? What mistakes have I made from which I need to recover? Your manager doesn’t walk around thinking about the answers to these questions. If you want thoughtful answers, set a time to meet with your boss, tell him/her the purpose of the meeting – to get feedback on your professional reputation so you can adeptly manage your career – and send the questions in advance, giving your boss time to prepare for the meeting. You will get more thoughtful and complete answers if your boss has two weeks to think about the questions and ask others for input. Don’t be caught off guard by a less-than-stellar professional reputation. Take control of your reputation and career. Ask more. Assume less. Write a comment about this week’s blog and we’ll enter your organization to win 50 professional reputation bookmarks! There are two purposes of giving feedback and only two purposes – to encourage people to either replicate or change a behavior. Providing input for any other reason doesn’t actually qualify as feedback and only serves to damage relationships. Sometimes we provide input because we’re frustrated or simply don’t like someone. Consider the purpose of your comments before you make them. If your intentions are pure – to help someone replicate or alter a behavior, then ask for permission and give feedback once given the green light. 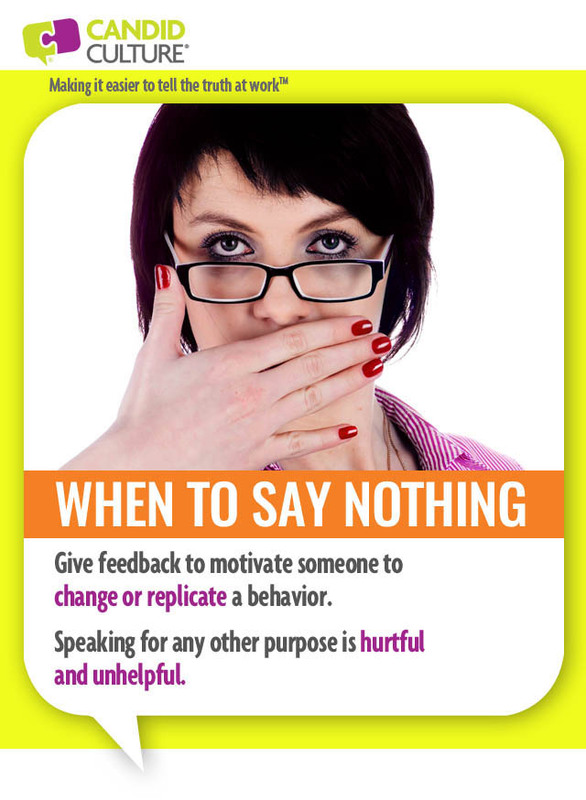 If you’re ‘just talking’ to talk or vent, say nothing. Giving feedback criteria one: You have the relationship to do so. You’ve built trust. The recipient will know your motives are pure – to add value and help. Giving feedback criteria two: You’ve asked for permission to give feedback. Even if your title grants you the permission to give feedback, asking if the person is open to the feedback can increase receptivity. Giving feedback criteria three: You’re not upset. Wait to give feedback until you’re calm, but don’t wait longer than a week (max two). Giving feedback criteria four: Four months haven’t passed since the incident happened that you want to address. If the purpose of feedback is to encourage someone to replicate or change a behavior, the feedback needs to be given shortly after the event occurred. If you wait, the feedback is unhelpful and creates suspicion of other things you haven’t said. Giving feedback criteria five: You have a specific example to provide. No example, no feedback. Feedback is supposed to be helpful. Telling someone they’re “doing a great job” is nice to hear but isn’t specific enough to be helpful or sincere. Likewise, telling someone their work isn’t “detailed oriented,” isn’t helpful without a specific example or two. Evaluate your motives before you speak. Are you attempting to encourage someone to alter or replicate a behavior, or are you just sharing your unsolicited opinion? Give feedback for the right reasons, and retain your relationships. We know impressions are made quickly and are hard to change. But it’s not impossible to repair your reputation. If you want to change how people see you, I’d suggest being very overt about the changes you’ve made. Don’t simply alter your behavior and wait for people to notice. They likely won’t. Once people have formed an opinion about you, that’s often their opinion for as long as they know you. For example, if you have a tendency to be late, even if you periodically show up on time, your friends and coworkers will think of you as the person who is always late. If you work with someone who tends to miss deadlines, even if she periodically turns work in on time, you’ll think of her as someone who misses deadlines. Once people make a decision about us, that’s often how they’ll see us for the duration our relationship. So if you want to repair your reputation, you’re going to have to do it overtly. Making changes and hoping people notice, won’t produce the desired result. Ask people who can impact your reputation and whose judgment you trust for feedback. Once you’ve absorbed the feedback, decide what, if any, changes you will make. Change your behavior for a period of weeks. Return to the people who gave you feedback, tell them about the behavior changes you’ve made, and ask them to observe your behavior. Tell the people who gave you feedback that you’ll ask them for feedback again in a few weeks, and you want to know what they see. Return to the people who gave you feedback and ask what changes they have or haven’t noticed. Repeat steps 3 through 7 at least quarterly. Everyone periodically does things that can damage their reputation. Overtly pointing out the behavior changes you’ve made, asking people who are important to you to pay attention, and give you additional feedback, is key to altering your reputation. Most people working to change their reputation don’t do this. They make behavior changes and hope others notice. If you want to alter your reputation and how others see you, you need to do so overtly. Tell people the changes you’ve made; don’t make them guess. Ask people to observe your behavior, and then ask for more feedback. And no matter how hard the feedback is to hear, don’t get defensive. Becoming defensive will ensure you don’t get feedback the next time you ask. 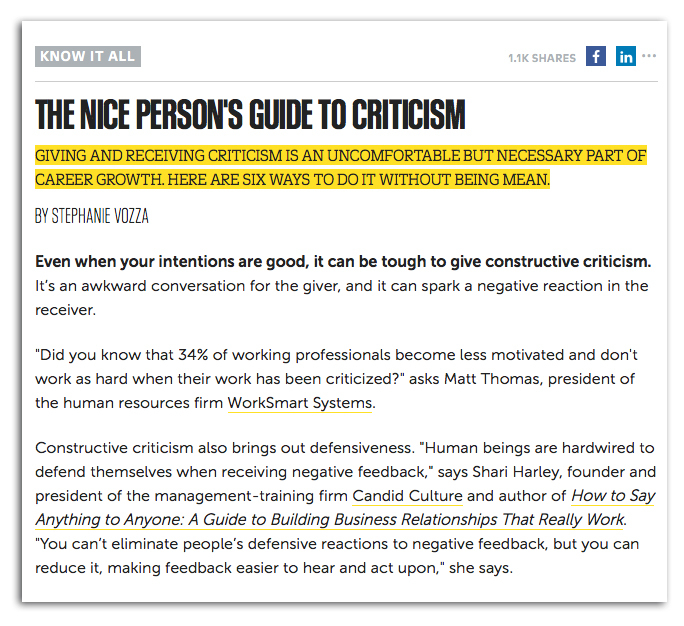 I’m honored to have been quoted in Fast Company’s article on how to give negative feedback. Check it out. EVEN WHEN YOUR INTENTIONS ARE GOOD, IT CAN BE TOUGH TO GIVE CONSTRUCTIVE CRITICISM. Constructive criticism also brings out defensiveness. 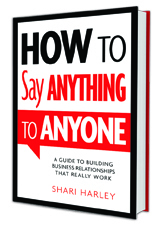 “Human beings are hardwired to defend themselves when receiving negative feedback,” says Shari Harley, founder and president of the management-training firm Candid Culture and author of How to Say Anything to Anyone: A Guide to Building Business Relationships That Really Work. “You can’t eliminate people’s defensive reactions to negative feedback, but you can reduce it, making feedback easier to hear and act upon,” she says. Instead, make it a practice to give small amounts of feedback at a time—one or two strengths and areas for improvement during a conversation. 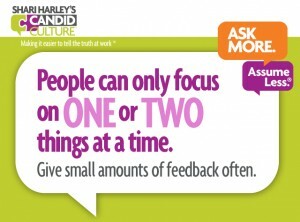 People cannot focus on more than one or two things at a time, says Harley. 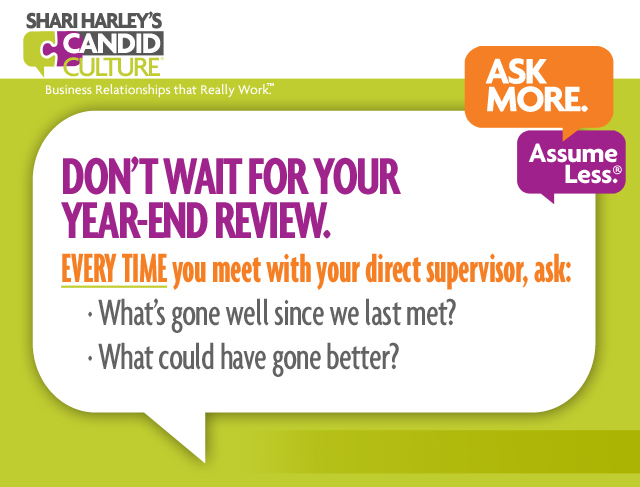 Give feedback close to the time of an event, but not when you’re upset, says Harley. “Praise in public, criticize in private,” says Harley. Make sure all negative feedback discussions happen behind a closed door. Click here to read the entire article at FastCompany.com. 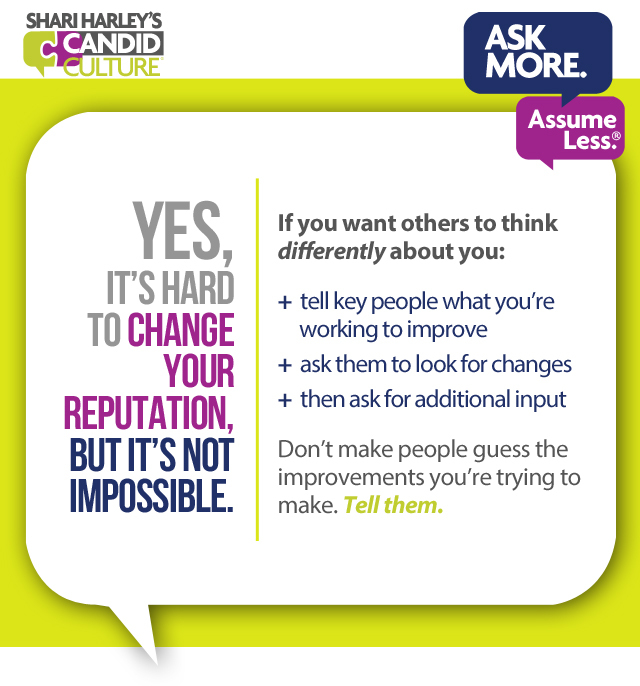 If you took my advice last week and asked your boss who impacts the decisions made about you at work and what those people think of you, you probably got some feedback. The question is, what should you do with the feedback? If I hear this one more time I might lose it. Most people hoard feedback. We wait for the right time, aka when we’re comfortable. That time will never come. The right time to give feedback is when something happens or shortly thereafter. Practice the 24-hour rule and the one-week guideline. Give feedback when you’re not upset, but soon after the event occurs, so people remember what you’re talking about. Most employees feel as if they’re treated unfairly during some portion of a performance appraisal. Employees receive feedback they’ve not previously heard, or receive feedback that is unbalanced – overly positive or negative, or the feedback is so vague employees aren’t sure what to do more, better or differently. Good performance appraisals are a quick summary of all the performance conversations you’ve had during the year and planning for next year. To have an appraisal meeting like this one, managers need to meet with their employees regularly and give feedback every time you meet. And that is the management BEST suggestion I can make. Meet regularly with your employees. If you never meet one-on-one with employees, start meeting monthly. If you meet monthly, meet twice a month. If you meet twice a month, consider meeting weekly for 30 minutes. What is the employee working on that’s going well? What is the employee working on that is not going great, but she doesn’t want your help? What is the employee working on this isn’t going great and she wants your help? Give each other feedback: What went well since you last met? What could be improved? ** Give and receive feedback on the work and on your relationship. This will be hard the first few times you do it, but will become easier with each successive conversation. Ask your employee to create a meeting agenda. Take notes on the agenda and keep your notes. The summary of these meetings becomes your annual performance appraisal. Regardless of whether or not you’re meeting regularly, throughout the year and have performance notes, you can only give small pieces of feedback during the appraisal meeting. Discuss three SPECIFIC things the employee did well during the year and three things she should do next year. People can’t focus on more. Think about the New Year’s resolutions you may have made last January. You might have promised yourself you’d save ten percent of your income, lose twenty pounds, take a two-week vacation without your phone, and apply to attend graduate school. How many of those things did you do? Setting too many aggressive goals sets us up to fail. And performance appraisals are not different. Consider how each of your employees must impact your department and your organization’s annual goals. In that context, determine the most important things each employee did to contribute to those goals this past year and what she should have done more, better or differently? That’s your appraisal. Not more and not less. During performance appraisals, force yourself to focus on and present ONLY the most important behaviors and outcomes, and your employees will bring the same focus to the ensuing year. Many organizations spend more money than they have to on employee recognition gifts and appreciation programs that often involve bonuses, paid time off, contests, gifts, and other expensive forms of compensation. What employees want most is to know they’re doing a good job. Giving feedback in the workplace is the cheapest, most effective, and often overlooked form of employee recognition. Employees want to know how they’re performing, and most employees get little to no positive or constructive feedback at work. They may not want to hear negative feedback, but employees want to know if they aren’t meeting expectations. Do you prefer to receive information via email, voicemail, or text message? Are you a big picture or a detail person? What are your pet peeves at work? What type of work do you like to do most? What type of work do you like to do least? What do you wish I would start, stop, and continue doing? I am consistently amazed at how often training participants ask what their coworkers wish they would start, stop and continue doing. I assume employees will be hesitant to ask for constructive feedback in front of a group of peers. But training participants consistently tell me that they get almost no positive or constructive feedback at work, and they’re desperate for the information. Give clear, specific, and timely positive and negative feedback. Employees want to know how they’re performing. Ask what type of work employees really want to do, and let them do that work most of the time. Ask what skills employees want to learn, and give them a chance to attain those skills. Write hand written notes of appreciation. Employees at Candid Culture get their birthdays off paid. We often buy employees lunch, give bonuses, and have a generous time off policy. Those perks are important and do help retain employees. But monetary rewards never replace or supersede the value of being aware of employees’ performance and caring enough to tell employees the truth.